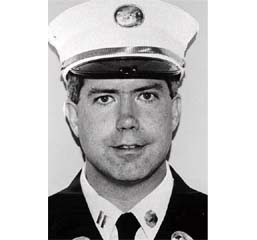 NYFD Captain Timothy Stackpole had just been promoted to Captain the Thursday before 9/11. He had just returned to duty after sustaining severe burns in another fire he fought. After some months of light duty at Ladder 103 in Brooklyn, "he felt it was a tremendous victory when he came back to the firehouse to full duty a few months ago," said the Rev. Jim Cunningham, the Stackpoles' parish priest in Marine Park, Brooklyn. The Thursday before the terrorist attack, Lieutenant Stackpole was promoted to captain. And on the Saturday before the disaster, Captain Stackpole was named Irishman of the Year at the Great Irish Fair in Brooklyn, Father Cunningham said. On September 11, 2001 Captain Stackpole had just finished his shift when he heard of the news. It is said he went straight to World Trade Center 2, where he perished. "I met Captain Timothy Stackpole at the Burn Unit, Cornell Medical Center, in 1998. And I remember him saying, 'My mother always warned me I should put on clean underwear, but I forgot to put them on today.' On September 11, Captain Timothy Stackpole formed a company of firefighters, and together, they raced up into the inferno that was Number 2 World Trade Center. Not one of these extraordinary men ever questioned his duty, nor did he ever question whether he might return to the embrace of those he loved and those who loved him. Nobody can take your father away from you. He is part of you. The tears will make you stronger... we have to cry, and we have to mourn." To all the family and friends of Captain Stackpole I send my prayers. He will not be forgotten. 2 Responses to "9/11 Tribute to Captain Timothy Stackpole NYFD"
The heroism of the firefighters that day will not be forgotten. Thank you for your trbute to Timothy.